Tripoli (Arabic: طرابلس‎ / ALA-LC: Ṭarābulus; Lebanese Arabic: Ṭrāblos; Greek: Τρίπολις / Tripolis; Turkish: Trablusşam) is the largest city in northern Lebanon and the second-largest city in the country. Situated 85 kilometers (53 miles) north of the capital Beirut, it is the capital of the North Governorate and the Tripoli District. Tripoli overlooks the eastern Mediterranean Sea, and it is the easternmost seaport in Lebanon. It holds offshore a string of four small islands, the only surviving islands of Lebanon. The largest of these islands, the Island of Palm Trees, was declared a protected reserve by UNESCO in 1992 for its rich ecosystem of trees, green sea turtles, and exotic birds. With the formation of Lebanon, Tripoli, once equal in economic and commercial importance to Beirut, was cut off from its traditional trade relations with the Syrian interior and declined in relative prosperity. Tripoli had a number of different names as far back as the Phoenician age. In the Amarna letters the name "Derbly" was mentioned, and in other places "Ahlia" or "Wahlia" are mentioned (14th century BCE). In an engraving concerning the invasion of Tripoli by the Assyrian King Ashurnasirpal II (888-859 BCE), it is called Mahallata or Mahlata, Mayza, and Kayza. Under the Phoenicians, the name Athar was used to refer to Tripoli. When the Greeks settled in the city they called it "Tripoli", meaning "three cities". The Arabs called it a variety of names, including the Princedom of Tripoli, the State of Tripoli, and the Eastern Tripoli Kingdom. In addition, the names Tarabulus, or Atrabulus, and Tarablus al-Sham, were used. The Crusaders settled in Tripoli for about 180 years and made it the capital of the County of Tripoli. The city was also simply named "Triple". The city shares the same etymology "Tripolis" as its younger sister city, the Libyan capital Tripoli. Today, Tripoli is also known as al-Fayha'a, which is a term derived from the Arabic verb Faha which is used to indicate the diffusion of a scent or smell. Tripoli was best known for its vast orange orchards. During the season of blooming, the pollen of orange flowers is carried on the air, creating a splendid perfume which fills the city and suburbs, hence the name al-Fayha'a. 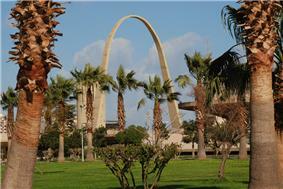 Tripoli has a Mediterranean Climate (Csa) with mild winters and moderately hot summers. Temperatures are moderated throughout the year due to the warm Mediterranean Current coming from Western Europe. Therefore, temperatures are warmer in the winter by around 10 °C (50 °F) and a bit cooler in the summer by around 7 °C (45 °F) compared to most of Lebanon. Although snow is an extremely rare event that only occurs around once every 5 years, hail and sleet are very common and occur fairly regularly in the winter. Rainfall is concentrated in the winter months, with the summer typically being very dry. There is evidence of settlement in Tripoli that dates back as early as 1400 BCE. In the 9th century BCE, the Phoenicians established a trading station in Tripoli and later, under Persian rule, the city became the center of a confederation of the Phoenician city states of Sidon, Tyre, and Arados Island. Under Hellenistic rule, Tripoli was used as a naval shipyard and the city enjoyed a period of autonomy. It came under Roman rule around 64 BCE. In 551, an earthquake and tidal wave destroyed the Byzantine city of Tripoli along with other Mediterranean coastal cities. During Umayyad rule, Tripoli became a commercial and shipbuilding center. It achieved semi-independence under Fatimid rule, when it developed into a center of learning. The Crusaders laid siege to the city at the beginning of the 12th century and were able finally to enter it in 1109. This caused extensive destruction, including the burning of Tripoli's famous library, Dar al-Ilm (House of Knowledge), with its thousands of volumes. During the Crusaders' rule the city became the capital of the County of Tripoli. In 1289, it fell to the Mamluks and the old port part of the city was destroyed. A new inland city was then built near the old castle. During Ottoman rule from 1516 to 1918, it retained its prosperity and commercial importance. Tripoli and all of Lebanon was under French mandate from 1920 until 1943, when Lebanon achieved independence. Many historians deny the presence of any Phoenician civilization in Tripoli before the 8th (or sometimes 4th) century BCE. However, a careful investigation of the sequence of Phoenician port establishments on the Lebanese coast will realize a north-to-south gradient, thus, indicating an earlier age for the Phoenician Tripoli. As well, the Phoenicians generally preferred cities that had islands in front of them, as is the case with Tripoli. In addition, the proximity of the Kadisha (Abou Ali) river would have been a strong draw to the area. Tripoli has not been extensively excavated because the ancient site lies buried beneath the modern city of El Mina. However, a few accidental finds are now in museums. Excavations in El Mina revealed skeletal remains of ancient wolves, eels, and gazelles, part of the ancient southern port quay, grinding mills, different types of columns, wheels, Bows, and a necropolis from the end of the Hellenistic period. A sounding made in the Crusader castle uncovered Late Bronze Age, Iron Age, in addition to Roman, Byzantine, and Fatimid remains. At the Abou Halka area (at the southern entrance of Tripoli) refuges dating to the early (30,000 years old) and middle Stone Age were uncovered. Tripoli became a financial center and main port of northern Phoenicia with sea trade (East Mediterranean and the West), and caravan trade (North Syria and hinterland). Under the Seleucids, Tripoli gained the right to mint its own coins (112 BCE); it was granted autonomy between 104 and 105, which it retained until 64 BCE. At the time, Tripoli was a center of shipbuilding and cedar timber trade (like other Phoenician cities). During this period, Tripoli witnessed the construction of important public buildings including municipal stadium or gymnasium due to strategic position of the city midway on the imperial coastal highway leading from Antioch to Ptolemais. In addition, Tripoli retained the same configuration of three distinct and administratively independent quarters (Aradians, Sidonians, and Tyrians). The territory outside the city was divided between the three quarters. Tripoli gained in importance as a trading centre for the whole Mediterranean after it was inhabited by the Arabs. Tripoli was the port city of Damascus; the second military port of the Arab Navy, following Alexandria; a prosperous commercial and shipbuilding center; a wealthy principality under the Kutama Ismaili Shia Banu Ammar emirs. During a visit by the traveler Nasir-i-Khusrau in 1047, he estimated the size of the population in Tripoli to be around 20,000 and the majority were alevism. Legally, Tripoli was part of the jurisdiction of the military province of Damascus (Jund Dimashq). Citadel of Raymond de Saint-Gilles. The city became the chief town of the County of Tripoli (Latin Crusader state of the Levant) extending from Jubayl to Latakia and including the plain of Akkar with the famous Krak des Chevaliers. Tripoli was also the seat of a bishopric. Tripoli was home to a busy port and was a major center of silk weaving, with as many as 4,000 looms. Important products of the time included lemons, oranges, and sugar cane. It is curious to reflect that for 180 years, during the French rule, Langue d'Oc, the language of Provence, was spoken in Tripoli and a neighbouring village, owing to the influence of a number of Provençal nobles and courtiers who came here. At that time, Tripoli had a heterogeneous population including Western Europeans, Greeks, Armenians, Maronites, Nestorians, Jews, and Muslims. During the Crusade period, Tripoli witnessed the growth of the inland settlement surrounding the "Pilgrim's Mountain" (the citadel) into a built-up suburb including the main religious monuments of the city such as: The "Church of the Holy Sepulchre of Pilgrim's Mountain" (incorporating the Shiite shrine), the Church of Saint Mary's of the Tower, and the Carmelite Church. The state was a major base of operations for the military order of the Knights Hospitaller, who occupied the famous castle Krak Des Chevaliers (today a UNESCO world heritage site). The state ceased to exist in 1289, when it was captured by the Egyptian Mamluk sultan Qalawun. During the Mamluk period, Tripoli became a central city and provincial capital of the Mamlakah or kingdom (one of six in Mamluk Syria). Tripoli ranked third after Aleppo and Damascus. The kingdom was subdivided into six willayahs or provinces and extended from Jubayl and Aqra mountains south, to Latakia and al Alawiyyin mountains north. It also included al-Hermel, the plain of Akkar, and Hosn al-Akrad (Krak des Chevaliers). Tripoli became a major trading port of Syria supplying Europe with candy, loaf and powdered sugar (especially during the latter part of the 14th century). The main products from agriculture and small industry included citrus fruits, olive oil, soap, and textiles (cotton and silk, especially velvet). The Mamluks formed the ruling class holding main political, military and administrative functions. Arabs formed the population base (religious, industrial, and commercial functions) and the general population included the original inhabitants of the city, immigrants from different parts of Syria, North Africans who accompanied Qalawun's army during the liberation of Tripoli, Eastern Orthodox Christians, some Western families, and a minority of Jews. 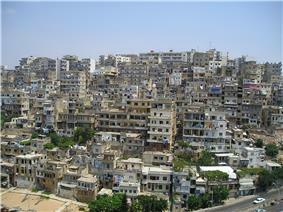 The population size of Mamluk Tripoli is estimated at 20,000-40,000; against 100,000 in each of Damascus and Aleppo. Mamluk Tripoli witnessed a high rate of urban growth and a fast city development (according to traveler's accounts). It also had poles of growth including the fortress, the Grand Mosque, and the river banks. The city had seven guard towers on the harbor site to defend the inland city. 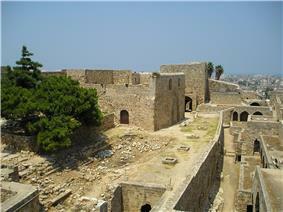 During the period the castle of Saint Gilles was expanded as the Citadel of Mamluk Tripoli. The "Aqueduct of the Prince" was reused to bring water from the Rash'in spring. Several bridges were constructed and the surrounding orchards expanded through marsh drainage. Fresh water was supplied to houses from their roofs. The urban form of Mamluk Tripoli was dictated mainly by climate, site configuration, defense, and urban aesthetics. The layout of major thoroughfares was set according to prevailing winds and topography. The city had no fortifications, but heavy building construction characterized by compact urban forms, narrow and winding streets for difficult city penetration. Residential areas were bridged over streets at strategic points for surveillance and defense. The city also included many loopholes and narrow slits at street junctions. The religious and secular buildings of Mamluk Tripoli comprise a fine example of the architecture of that time. The oldest among them were built with stones taken from 12th and 13th-century churches; the characteristics of the architecture of the period are best seen in the mosques and madrassas, the Islamic schools. It is the madrassas which most attract attention, for they include highly original structures as well as decoration: here a honeycombed ceiling, there a curiously shaped corniche, doorway or moulded window frame. Among the finest is the madrassa al-Burtasiyah, with an elegant façade picked out in black and white stones and a highly decorated lintel over the main door. 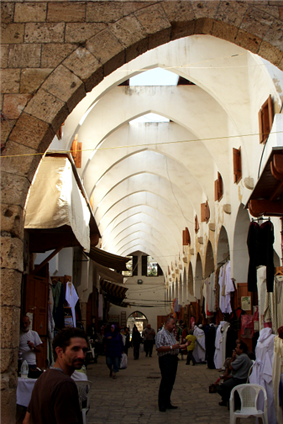 Public buildings in Mamluk Tripoli were emphasized through sitting, façade treatment, and street alignment. Well-cut and well-dressed stones (local sandstone) were used as media of construction and for decorative effects on elevations and around openings (the ablaq technique of alternating light and dark stone courses). Bearing walls were used as vertical supports. Cross vaults covered most spaces from prayer halls to closed rectangular rooms, to galleries around courtyards. Domes were constructed over conspicuous and important spaces like tomb chambers, mihrab, and covered courtyards. Typical construction details in Mamluk Tripoli included cross vaults with concave grooves meeting in octagonal openings or concave rosettes as well as simple cupolas or ribbed domes. The use of double drums and corner squinches was commonly used to make transition from square rooms to round domes. Decorations in Mamluk buildings concentrated on the most conspicuous areas of buildings: minarets, portals, windows, on the outside, and mihrab, qiblah wall, and floor on the inside. Decorations at the time may be subdivided into structural decoration (found outside the buildings and incorporate the medium of construction itself such as ablaq walls, plain or zigzag moldings, fishscale motifs, joggled lintels or voussoirs, inscriptions, and muqarnas) and applied decoration (found inside the buildings and include the use of marble marquetry, stucco, and glass mosaic). Mosques evenly spread with major concentration of madrasas around the Grand Mosque. All khans were located in the northern part of the city for easy accessibility from roads to Syria. Hammams (public baths) were carefully located to serve major population concentrations: one next to the Grand Mosque, the other in the center of the commercial district, and the third in the right-bank settlement. Major buildings in Mamluk Tripoli included six congregational mosques (The Mansouri Great Mosque, al-Aattar, Taynal, al-Uwaysiyat, al-Burtasi, and al-Tawbat Mosques). In addition, there were two quarter masjids (Abd al-Wahed and Arghoun Shah), and two mosques that were built on empty land (al-Burtasiah and al-Uwaysiyah). Other mosques incorporated earlier structures (churches, khans, shops, ...). One of the most beautiful mosques is the Taynal mosque, whose quiet design, splendid minaret and different cupolas make it one of the most interesting sights in the city. Mamluk Tripoli also included 16 madrasas of which four no longer exist (al-Zurayqiyat, al-Aattar, al-Rifaiyah, and al-Umariyat). Six of the madrasas concentrated around the Grand Mosque. Tripoli also included a Khanqah, many secular buildings, five Khans, three hammams (Turkish baths) that are noted for their cupolas. Hammams were luxuriously decorated and the light streaming down from their domes enhances the inner atmosphere of the place. 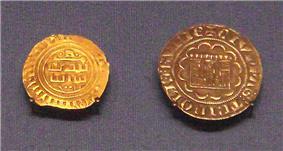 Tripoli gold bezant in Arabic (1270-1300), and Tripoli silver gros (1275-1287). British Museum. During the Ottoman period, Tripoli became the provincial capital and chief town of the Eyalet of Tripoli, encompassing the coastal territory from Jubayl to Tarsus and the inland Syrian towns of Homs and Hama; the two other eyalets were Aleppo Eyalet, and Şam Eyalet. 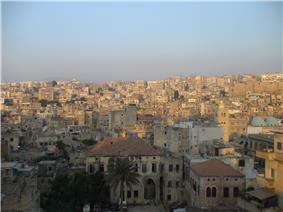 Until 1612, Tripoli was considered as the port of Aleppo. It also depended on Syrian interior trade and tax collection from mountainous hinterland. Tripoli witnessed a strong presence of French merchants during the 17th and 18th centuries and became under intense inter-European competition for trade. Tripoli was reduced to a sanjak centre in the Vilayet of Beirut in 19th century and retained her status until 1918, when was captured by British forces. Public works in Ottoman Tripoli included the restoration of the Citadel of Tripoli by Suleiman II, the Magnificent. Later governors brought further modifications to the original Crusader structure used as garrison center and prison. Khan al-Saboun (originally a military barrack) was constructed in the center of the city to control any uprising. Early Ottoman Tripoli also witnessed the development of the southern entrance of the city (al-Muallaq Mosque and Hammam al-Jadid). Even though a fair amount is known about the codes of medical ethics and practice and the physician-patient relationship in ancient civilizations, there is little evidence that the formalized practice of legally binding informed medical consent existed before the late 19th century. "The reason why this document had been written down is that the Christian Ya'qub, son of Ghanem, the Monk in Balamand Monastery, Koura Sub-district, province of Tripoli, presented himself at the Holy Shari'a Council of Tripoli and hired and engaged the Christian surgeon Nicholas, son of Yanni, to extract his (Ya'qub's) hernia on the right side in return for a fee of 10 piasters. After the hired has undertaken to extract the hirer's hernia and treat it with ointments, the aforementioned hirer asked people to duly and legally bear witness that if the hirer died as a result of fate and Allah's divine decree because of his being treated by the hired, the latter shall not be held as guarantor for him; and the hirer has also relieved the hired from any responsibility for his death and blood money, and that the hirer or his heir after him shall not be entitled to any related claims made against the aforesaid surgeon. Effected and written down on the twelfth day of the holy month of Sha'ban of the year 1088. Witnesses: Mawlana Sheikh Mustafa - may his grace be augmented. Mawlana Sheikh Mohammed, scriber of the original copy. Mohammed Shalabi, Interpreter. Hussein Buluk Bashi. Haj Ramadan, Chief Court Usher." The document, which was recorded during the Ottoman Empire, attests to the established practice of legal contracts between physician and patient, which were drawn up and signed in the presence of witnesses. It is interesting to note that the contract was not limited to the surgical procedure, but also included postoperative treatment and physician fees. Ottoman Tripoli embraced many religious buildings, such as: al-Muallaq or "hanging" Mosque (1559), al-Tahhan Mosque (early 17th century), and al-Tawbah mosque (Mamluk construction, destroyed by 1612 flood and restored during early Ottoman Period). It also included several secular buildings, such as: Khan al-Saboun (early 17th century) and Hammam al-Jadid (1740). 14th–8th century BCE: Phoenician trading station. Later on, Phoenicians started sailing to shores of Northern Africa and South Europe and establishing cities in many Mediterranean localities. 550–351 BCE: Phoenicia became a province of the Persian Empire. 351 BCE: Full independence proclaimed by Phoenician states from the Persian Empire. 358 BCE: Triple city coalesced into one entity; became the center of Phoenician confederation and neutral meeting ground for the governors of the three main Phoenician cities/seaports: Aradus (modern Ruad in Syria), Sidon, and Tyre. 333 BCE: Alexander the Great in Phoenicia following victory over Persian king at Issus, arsenals of Tripolis harbor burned down. 323 BCE: Alexander's death and break-up of his empire into three parts: Macedon, Egypt (ruled by the Ptolemies), and the Seleucid Empire. Struggle between the Ptolemies of Egypt and the Seleucid kings of Antioch; Tripolis passed back and forth between the two powers. 64 BCE: Phoenicia and the rest of Syria became a Roman province; Tripoli, Tyre and Sidon granted privileges of self-government (secondary role of Tripolis compared to Beirut and Sidon); Roman general Pompey beheaded Dionysius, the ruler of Tripolis, judged as tyrant. 37–36 BCE: Tripolis is a part of the donations by Marc Antony to Cleopatra. 117–138 CE: Under Emperor Hadrian, Tripolis was granted the right of asylum and assigned a naval command; it became an important religious center with a temple for imperial cult; from numismatic evidence it must have had temples dedicated to Astarte, the Dioscuri and Zeus Haghios. 551: City destroyed by earthquake and tsunami and rebuilt with the help of Byzantine Emperor Justinian I. 645/646: Muslim army laid siege to Tripoli. General Sufyan built a fort on Abu Samra hilltop to survey the city; population fled to Cyprus; Tripoli captured and resettled with Persians and Jewish population. 646–1070: Tripoli subject to Byzantine incursions during the Umayyad, Abassid and Fatimid rule aimed at the control of the coastal road. 1070–1109: Tripoli politically independent from the Fatimids under the Banu Ammar emirs, who built the famous Dar Al-Ilm (a library that contained around 3,000,000 manuscripts). 1099: Beginning of a ten years siege of Tripoli by Raymond of Saint-Gilles, Count of Toulouse (d. 1105 prior to the ending of the siege). 1103: Beginning of the construction of the Citadel. 1109: Fall of Tripoli to the Crusaders and its rebuilding over Muslim town. 1268: The castle and the Crusaders burg occupied and destroyed by Baibars. 1289: Fall of Crusader Tripoli (harbor city or El Mina) to Sultan al-Mansur Qalawun; city site was transferred afterwards inland to the foot of Mount Peregrinus (Abu Samra) for protection against the return of the knights still on Cyprus and Rhodes; Arab Tripoli or medina built around inland citadel (the castle of saint-Gilles) over Crusader bourg and along the banks of Qadisha River (Abu Ali). 1516: Syria and Egypt fell to the Ottoman Sultan Selim I. 1535: Signature of treaty by Suleiman the Magnificent and François I, King of France, giving France favors and privileges in the Levant. 1612: Flood destroyed Mamluk monuments. 1623: Fakhr-ed-Din attacked the forces of Pasha of Tripoli at Anjar; Tripoli fell to Fakhr-ed-Din, (Sultan al-Barr or Sultan of the Land). 1798–1835: Mustafa Agha Barbar ruled as governor of Tripoli on behalf of the Ottoman Empire. the citadel takes its name from Raymond de Saint-Gilles, who dominated the city in 1102 and commanded a fortress to be built in which he named Mont Pelerin (Mt Pilgrim). The original castle was burnt down in 1289, and rebuilt again on numerous occasions and was rebuilt in 1307-08 by Emir Essendemir Kurgi. Later the citadel was rebuilt in part by the Ottoman Empire which can be seen today, with its massive Ottoman gateway, over which is an engraving from Süleyman the Magnificent who had ordered the restoration. In the early 19th century, the Citadel was extensively restored by the Ottoman Governor of Tripoli Mustafa Agha Barbar. 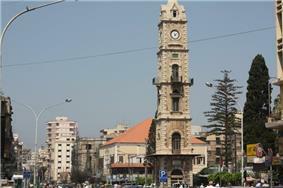 The Clock tower is one of the most iconic monuments in Tripoli. 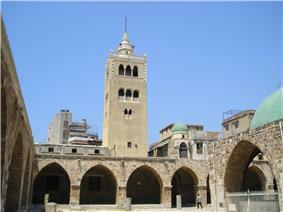 The tower is located in Al-Tell square, and was constructed by the Ottomans as a gift to the city of Tripoli. The Clock tower recently underwent a complete renovation in 1992 with personal funding from the honorary Turkish consul of Northern Lebanon, Sobhi Akkari and now the clock tower is again operational. 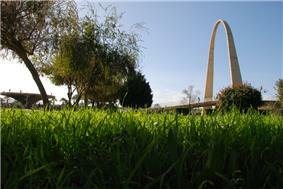 "Al Manshieh" which is one of the oldest parks in Tripoli, is located next to The clock tower and is a very popular attraction. This clock tower was erected in 1906 to celebrate the 30th year of Abdulhamid II of the Ottoman Empire, like the Jaffa Clock Tower and many others throughout the Empire. 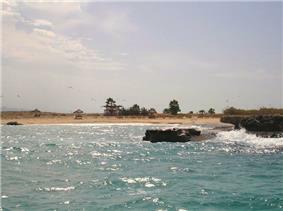 Tripoli has many offshore islands. The largest is called today the "Island of Palm Trees" by some, and by others "Rabbits’ Island". This is the largest of the islands with an area of 20 hectares (49 acres). The name "Araneb" or Rabbits comes from the great numbers of rabbits that were grown on the island during the time of the French mandate early in the 20th century. It is now a nature reserve for green turtles, rare birds and rabbits. Declared as a protected area by UNESCO in 1992, camping, fire building or other depredation is forbidden. In addition to its scenic landscape, the Palm Island is also a cultural heritage site. Evidence for human occupation, dated back to the Crusader period, was uncovered during 1973 excavations by the General Directorate of Antiquities. Locally known as Abdulwahab Island, the island was leased to Adel & Khiereddine Abdulwahab as a shipyard, since the Ottoman rule and till this day a well known ship and marine contractor. It was also known as St Thomas Island during the Crusades. It is the closest to the shore and can be accessed via a bridge that was built in 1998. The island's name comes from a plant found on the island and used to make brooms. Some people claim that the name comes from the word "blue whale" (Baleine in French) that appeared next to the island in early 20th century. The island is 1,600 meters (5,200 ft) long and is the home of a light-house built during the 1960s. 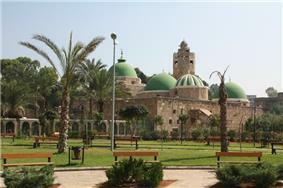 Tripoli is a very rich city containing many mosques that are spread all over the city. In every district of the city there is a mosque. During the Mamluk era, a lot of mosques were built and many still remain until today. Tripoli has a large number of schools of all levels, public and private. It is also served by several universities within the city limits as well as in its metro area. At the end of the 15th century, the governor of Tripoli (Lebanon) Youssef Bek Sayfa established Khan Al Saboun (the hotel of soap traders). This market was finished at the beginning of the 16th century, the last days of the Mamlouks ruling. The manufacture of soap was very popular in Tripoli. There, the market became a trade center where soap was produced and sold. Afterwards, traders of Tripoli began to export their soap to Europe. At first, those perfumed soaps were offered as gifts in Europe. Therefore, handiwork developed in Tripoli. Due to the ongoing increase of the demand, craftsmen started to consider this job as a real art and wanted to satisfy their customers by manufacturing various forms of more effective good-quality soap. That's how the Arab and occidental countries began to import the soap of Tripoli. Nowadays, we find all kinds of soaps in Tripoli: slimming soaps, anti-acne soaps, moisturizing soaps, etc. Some producers are even turning to exportation more than ever. The raw material used for these kinds of soap is olive oil. The Tripoli soap is also composed of: honey, essential oils, and natural aromatic raw materials like flowers, petals, and herbs. The soaps are dried in the sun, in a dry atmosphere, allowing the evaporation of the water that served to mix the different ingredients. The drying operation lasts for almost three months. As the water evaporates, a thin white layer appears on the soap surface, from the soda that comes from the sea salts. The craftsman brushes the soap very carefully with his hand until the powder trace is entirely eliminated. The International Fair of Tripoli site, formally known as the Rachid Karami International Exhibition Center, is a complex of buildings designed by the Brazilian architect Oscar Niemeyer. The site was built for a World's Fair event to be held in the city, but construction was halted in 1975 due to the outbreak of the Lebanese civil war, and never resumed. The site contains 15 semi-completed Niemeyer buildings within an approximate 100 km2 (40 sq mi) area near Tripoli's southern entrance. The whole complex is currently deserted. There have been occasional proposals to revive and repurpose the site, but these have not succeeded, partly for political reasons and partly due the fact that ongoing security in and around Tripoli discourages any sort of major investments in the city. Tripoli is globally recognized for its special sweets. And all other fresh juice like carrots and orange. Tripoli while once economically comparable to Beirut, has declined in recent decades. Organisations such as the Tripoli Entrepreneurs Club are currently trying to revive traditional export businesses such as furniture production, artisanal copper goods, soaps, as well as expand new industries such as ICT offshoring and new technological invention. Recently, a Tripoli development plan called "Tripoli Vision 2020" has been formulated and supported by a number of advisory councils including influential key government officials and prominent businessmen in the city. The goal of the project is to provides a comprehensive framework consisting of promoting investment, investing, training, re-skilling, talent placement and output promotion to reinvigorate the city’s economy. The Tripoli Vision 2020 was sponsored by the Prime Minister Saad Hariri Office and the Tripoli MPs Joint Office with the comprehensive study conducted by Samir Chreim of SCAS Inc.
See Oil pollution from ships in Tripoli. ^ This pronunciation of Tripoli's Arabic name is written down as طَرَابُلُس in vowelized form. ^ "طَرَابُلُس: Lebanon". Geographical Names. Retrieved 2010-12-13. ^ "Trâblous: Lebanon". Geographical Names. Retrieved 2010-12-13. ^ Les Peuples Et Les Civilisations Du Proche Orient by Jawād Būlus. p. 308. ^ Wanderings -2: History of the Jews by Chaim Potok. p. 169. ^ History of Syria, Including Lebanon and Palestine by Philip Khuri Hitti. p. 225. 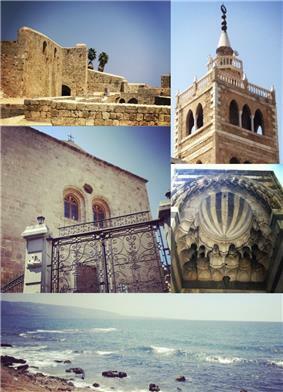 ^ Lebanon in Pictures By Peter Roop, Sam Schultz, Margaret J. Goldstein. p. 17. ^ Ghazi Omar Tadmouri (30 October 2009). "Names of Tripoli through the history". Tripoli City. Retrieved 14 November 2011. ^ "Appendix I: Meteorological Data" (PDF). Springer. Retrieved October 25, 2015. ^ a b c Saliba, R., Jeblawi, S., and Ajami, G., Tripoli the Old City: Monument Survey - Mosques and Madrasas; A Sourcebook of Maps and Architectural Drawings, American University of Beirut Publications, Beirut, Lebanon, 1995. ^ William Harris (19 Jul 2012). Lebanon: A History, 600-2011 (illustrated ed.). Oxford University Press. p. 49. ^ Tadmouri, O. AS., Loubnan min AlFath AlIslami hatta Soukout AlDawla AlOumawia (13-132 H/ 634–750 CE): Silsilat Dirasat fi Tarih AlSahel AlShami, Tripoli, 1990. Arabic. ^ Tadmouri, O. AS., Tarih Tarablus Al-Siyasi WalHadari Aabr Al-Ousour: Aasr Al-Mamalik, Tripoli, 1981. Arabic. ^ AlHumsi NS. History of Tripoli Through the Shari'a Court Documents in the Second Half of the Seventeenth century. Beirut (Lebanon): Al-Rissalah Foundation/Dar Al-Iman; 1986. p. 289. ^ "Robert Fadel - روبير فاضل". www.robertfadel.com. Retrieved 2015-10-16. "Tripoli". Grove Encyclopedia of Islamic Art & Architecture. Oxford University Press. 2009. "Tripoli". Islamic Cultural Heritage Database. Istanbul: Organisation of Islamic Cooperation, Research Centre for Islamic History, Art and Culture. ArchNet.org. "Tripoli". Cambridge, Massachusetts, USA: MIT School of Architecture and Planning.